We began our education program on a small scale by placing the first children in our care in a school outside our Spiti valley in Yol, not far from Dharamsala, where the Dalai Lama lives in exile. Spiti itself was too remote and poor for an unknown society like ours to think of building a school there straight away. When we had gained the confidence of parents and benefactors with the success of our work in Yol, we were able to undertake the construction of our own school in Spiti itself, in the village of Rangrik. The Dalai Lama inaugurated our new school in 1996, giving it the name Munsel-ling. This was a dream come true for us. It was the first English-medium private school in Spiti, and probably in the whole of the tribal belt of Himachal Pradesh. The first children were enrolled in kindergarten and primary class one. The school expanded by one class per year until 2006 when the oldest children reached class ten (age 16). Every spring since the school opened has seen some new construction starting or building from last year being resumed after the deep winter freeze. Most buildings on the campus are a variation on our traditional building methods, earthen walls with flat, earth covered roofs. They have solar space heating features to take advantage of Spiti's sunshine, bright and abundant even in the severe cold of winter. 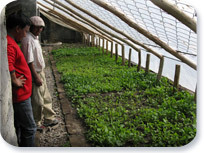 As well as the classrooms, offices and libraries to be expected, there is a large community hall, a dedicated health centre with a well-fitted dental clinic, guest accommodation not least for visiting foreign supporters and there are four large insulated greenhouses producing vegetables for the school kitchen except in the depths of winter. The school has its own purified water supply. In 1999 the school took in its first boarders. Though they may be only of primary school age, living away from home was the only way for children from outlying villages to receive a decent education. Approximately 300 of the present school population of 507 lives in the neat and cosy hostels. Many infrastructure improvements are still needed to complete the school. Many, if not most, of the children currently in our care are from low-income homes and whose parents who can by no means afford the full cost of their children's education. 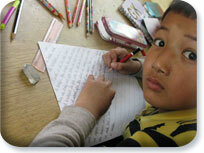 At Munsel-ling we have admitted fifty children from the most disadvantaged backgrounds completely free. Other parents we charge on a sliding scale, depending on their ability to pay. At Munsel-ling none are asked to pay more than INR 7,600/- (US$ 170) per year. The actual cost of a young boarding child's education is more than double that figure. That calculation includes running costs only, not capital costs. With the kind support of many helping hands, this is the income gap we are trying to bridge in our push for development. Given the educational backwardness of Spiti it will be some time before most of the teachers in Munsel-ling are Spitians. At present there are ten on a full-time teaching staff of twenty-nine. Of the rest, six are Tibetan refugees; others are Indians from outside Spiti. There are thirteen non-teaching staff. Our scheme of helping promising young people to qualify as teachers continues. We have also had volunteer teachers from abroad helping out with the timetable and giving valuable practice with spoken English. In adaptation to the harsh winter climate, school hours in winter are shorter, from 10 am to 4 pm. In summer the school runs from 9.30 am to 5 pm. 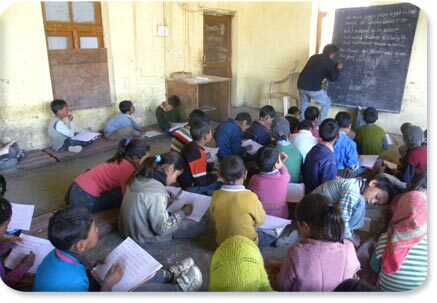 Munsel-ling is affiliated to the Himachal Pradesh State Board of Education. Our students' performance in their examinations at middle school and matriculation (c. age 16) levels is very creditable, though still with plenty of room for improvement. One girl and two boys from our educational scheme are now studying to be doctors at medical college. Several others are studying other senior professions such as engineering and veterinary science. We do not screen children for academic ability before admitting them and through lessons in Tibetan (Bhoti) language and training in our unique culture and Buddhist religion we aim to produce not just exam-passers but also students who are well grounded in enjoyment of our own minority culture. One important expression of our culture is singing and dancing. Our children are well-known up and down our valley for their expertise. Our children's performances in earlier years did much to revive the popularity of traditional Spiti song and dance and confidence in its truth and relevance at a time when the modern world and its prejudices were intruding more and more into our hitherto more remote valley. We have recently negotiated Munsel-ling School's affiliation with the HP Board of Education as a senior secondary school (ages 16-18). We are now planning how to fund and implement this expansion, which requires as well as more classrooms and more highly qualified staff, better resources such as libraries and sports facilities and, in science subjects, laboratories. The chief ornament of the Munsel-ling school campus is a twenty-five foot high Buddha statue, which stands on a hill behind the school and is visible from afar to weary travelers. 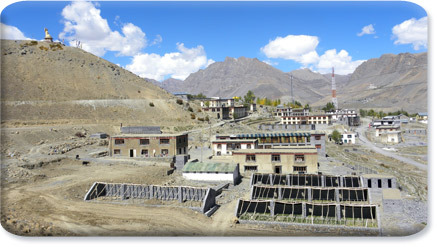 The school is situated at Spiti Valley's widest point. From the hill on which the statue stands there are spacious and tranquil views. To the north, on the far side of Spiti River's braided streams, the venerable buildings of Key Monastery are picturesquely heaped. To the south lies Spiti's ‘capital,' Kaza, and beyond it, down the valley, a succession of mountains, one out soaring the other in serene grandeur. In 1993 the Rinchen Zangpo Society for Spiti Development, new and unknown, had neither the backing nor the resources to build its own school in such a remote and poor a place as Spiti, so the first seventeen children in the care of the society were taken to be educated in a private school outside Spiti Valley in Yol, chosen for its close proximity to His Holiness the Dalai Lama's residence in exile in Dharamsala. It is in the same state as Spiti, Himachal Pradesh, two day's bus journey away in summer, three in winter. The cramped school basement was rented as accommodation for these children. The following year we began to manage our own hostel, in a building that we were eventually able to purchase. Over the years we extended the hostel so that more than seventy children of all school ages lived happily together there. A lack of space and direct road access hampered our further expansion plans. Eventually we found land in the neighbouring settlement of Sidbhari. Our purpose built girls' hostel opened there in 2004. Much further expansion has since taken place at Rakkar Road, Sidbhari. Due to the expense of maintaining two parallel establishments outside Spiti it made sense to shift our operation wholly to our new, more open site and we sold the old Yol hostel at the beginning of 2007. There are at present 64 young people at the Sidbhari site, all housed in our purpose-built, fully supervised hostel accommodation. Some are juniors. The majority are studying at senior secondary level (the last two years of secondary school). Twelve are attending college. There is a prayer hall. The dining and kitchen facilities are of a good standard. A block containing space for private study, library, multi-purpose hall and classrooms for after-hours tuition was finished in 2011. The classrooms on the ground floor are already in use for extra coaching classes. Apart from the part-time teachers giving extra tuition there are seven staff at the hostel and in the office. Though in the meantime we have been able to fulfill our original dream of establishing our own school in Spiti itself, which is now flourishing up to 10th class (age 16), our Sidbhari base remains an important part of our future plans. Sidbhari is where our most of our students come to finish their secondary education. This will continue for a little longer until we can fully meet the challenge of providing all the facilities required for a senior secondary school (age 16-18) in Spiti, a difficult challenge, given the long lines of communication, the rugged terrain and the severe winter. Especially difficult is recruiting the better qualified and better paid teachers of the more competitive science subjects for such a location. We do not have our own school in Sidbhari, simply hostel facilities. Children attend schools in the locality, some government run, some private. Our Sidbhari location is attractive, tree shaded and in a semi rural area. There are grand views of the misty Dhauladhar, in this area the first great upthrust of the Himalayan collision between India and the rest of Asia. It enjoys a refreshing climate, escaping the extreme heat of the plains and the extreme cold of Spiti. Living in the Dharamsala area gives our students a some opportunity to strengthen their own cultural roots by mixing with the large Tibetan exile community settled there and with visitors and pilgrims from all over the Buddhist Himalaya. 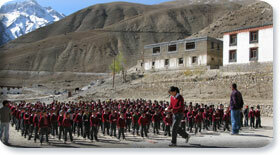 The Rinchen Zangpo Society opened a branch primary school in Kaza the Spiti headquarters in 2007. Parents have more cash income in the Spiti 'capital' so they are charged more realistic fees. Children from needy families and more distant villages continuing to be catered for at Munsel-ling School up the road in Rangrik. Then in 2010 we opened more feeder schools in four outlying villages, Sagnam, Losar, Key and Kibber. At the moment pre primary, all being well they will develop into primary schools. In 2010 we sent ten girls to Bangalore, S. India for primary school teacher training. In 2011 there were two branch primary school sites in Kaza and and new ones in Chicham and Kurik. Children at these schools are able to learn their ABC while living at home instead of having to board away from home at Munsel-ling School at too young an age. Munsel-ling concentrates more on education, relieved of the 24-hour care of so many small children. Jan Shikshan Sansthans are Peoples' Institutes of Education. They are an initiative of the central Indian government. They set out to bring education to those who have been bypassed by mainstream education. Whether from the back streets of the towns or remote, rural backwaters, through this programme people can access education free of cost to meet their needs later in life. The Rinchen Zangpo Society for Spiti Development is the first organization in the whole of Himachal Pradesh (population six million) to be selected to set up and administer a People's Institute of Education, a creditable first for the society. These institutes are fully funded by the central government, both capital and running costs. Training in tailoring and outfitting has started, concentrating on traditional Spiti wear, boots and all. The promotion of other beautiful traditional Spiti woollen handicrafts is another possibility. We plan to select ten women for training outside the valley in shawl making up to master crafts person level, to bring the standard of manufacture in Spiti to a high standard. The project is in its beginning stage. There is an office in Kaza. The post of director will be advertised shortly. A new nuns' community is coming up in Kaza following the Sakya tradition of Tibetan Buddhism. Yanchen Choling was the first establishment to be built in Spiti where nuns could follow a monastic way of life together. It was founded in 1985 in the village of Pangmo. There are approximately 30 nuns studying there. 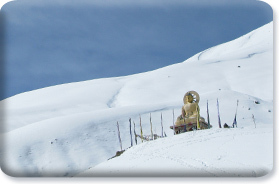 Sherab Choling Institute was founded in 1995 in Morang Village, upper Spiti. It has approximately 45 nuns. They follow their traditional study and training programme in a recently built modern institute. Dechen Choling Institute is a nunnery in Pin Valley associated with the Nyingma Kungri Monastery. It houses approximately 25 young nuns.